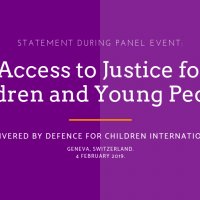 In each region of the world, Defence for Children International has a representative, whose role of a vice president includes promoting the image of the organisation in the region, ensuring that the organisation is connected to important regional bodies and mechanisms, and engaging them to advance the rights of children. The vice presidents coordinate national sections through sound regional programmes. In the course of 2013, the DCI International Executive Council and the International Secretariat have been looking at establishing ‘regional desks’, to help strengthen the work of the vice-presidencies and enhance collaboration at the regional level. Read more about the regional impact of DCI in: Africa, Americas, Europe and MENA region.